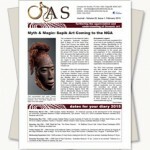 This edition of the OAS Journal once again traverses through time and space exploring aspects of Pacific cultures, from the first contact made by Captain James Cook in Hawaii to the current interactions of New York artist, Shiva Lynn Burgos, with the Kwoma people in PNG. Oceanic art plays a central role in both these encounters. The exquisite artefacts collected by Cook attested to the almost absolute power of Hawaii’s ruling clique and the curious, convoluted and ultimately lethal relationship that developed between the two is explored in Nick Higginbotham’s article on his forthcoming production entitled Between Worlds. At the other end of the Pacific time-line is Shiva’s fascinating artistic journey from the Metropolitan Museum of Art’s famous Kwoma ceiling in New York to its place of origin in a remote Sepik village. These two stories remind us that the process of cultural engagement and discovery, which has shaped the contemporary Pacific nations and enriched the Western world in many ways, is still ongoing. Men at Work. 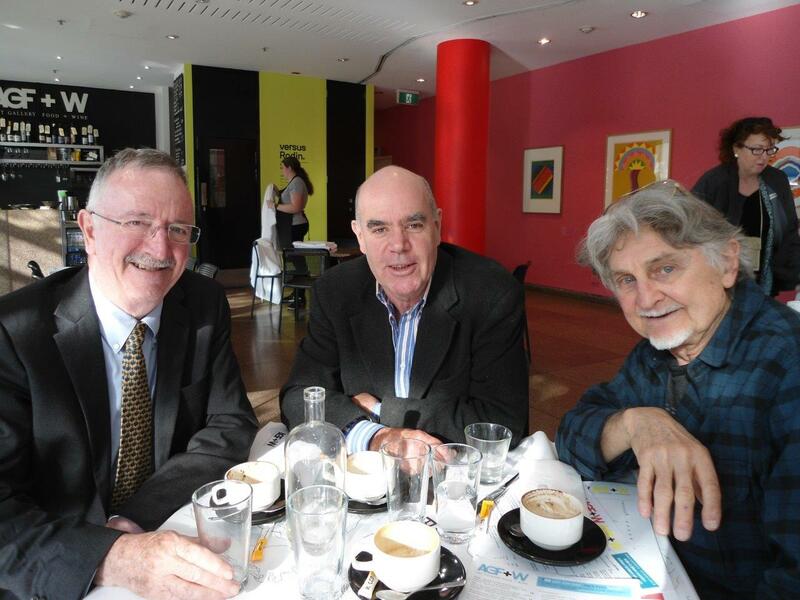 Author Professor Peter McCabe, OAS Journal Editor Dr. Jim Elmslie, and author Dr. Barry Craig discuss matters Oceanic at the Art Gallery of South Australia. Image by Crispin Howarth. Peter McCabe’s write-up on his OAS talk earlier this year on the beaded aprons of Geelvink Bay shows us that the external cultural influences on Oceanic art and cultures came not only from the West but also from the East, as Peter teases out the meanings embodied in the aprons’ intricate patterns. Barry Craig features again with the first half of Part 6 of his series on the early collectors of the South Australian Museum, this time telling the story of colonial ‘hard man’, Harry Lort Spencer Balfour Ogilvy. I find it interesting to compare the very different experiences of both Westerners and indigenous people that these encounters produced. From Cook’s respect for the power of the traditional Hawaiians, to Balfour Ogilvy’s stern colonial disregard of the ‘natives’, the circle turns again and we glimpse Shiva’s immersion in, and high respect for, contemporary Kwoma culture. Oceanic art plays a starring role in all these stories with the artefacts representing an enduring link between the external actors and the traditional peoples with which they engaged. Over the next few months OAS members will have several opportunities to deepen their knowledge on Oceanic art – and the chance to acquire some excellent pieces for their own collections. The Tribal Art Fair Sydney, now located at the Eastern Suburbs Masonic Centre on July 22, promises to be an exciting event with private collectors as well as dealers presenting a wide array of artworks to the market. TAFS has grown year on year and now is a firm fixture on the OAS calendar, both for the Oceanic art on display and the chance to mingle with like-minded souls. The OAS Forum this year is to be held at the regal Savage Club in Melbourne on October 21. Speakers, including leading Australian and international experts in their fields, are being confirmed by Forum organizers under the decisive leadership of Dr. Michael Martin. When speakers for the Forum are finalized members will be informed by email and details posted on our website. The next OAS event is the talk by Mark Blackburn, Stoned – Lithic Technology of the Ancient Polynesians, at the Australian Museum at 6.30 pm on July 19. Mark, perhaps the world’s most famous and prolific collector of Polynesian art, is a respected expert in this field so it will be a great privilege to hear his thoughts on the stone adzes of Polynesia – which Mark describes as ‘the ultimate representation of form and function’. With his engaging manner and authoritative style underpinned by vast knowledge, the chance to hear an expert of Mark’s standing is strongly recommended to all members.